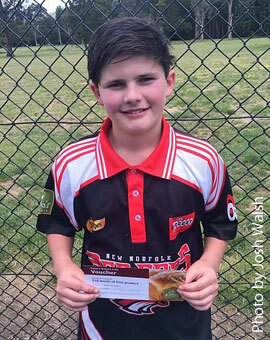 CONGRATULATIONS to New Norfolk Under 13s cricketer Jack Morgan-Miller who had a day out in the match against Wellington last Sunday. He made made his first half-century and finished on 51 runs, as well as taking 2-8 off three overs and two catches. Great work Jack! Well done also to three Gretna juniors. During their Round 6 win over Brighton, Zac Wheeler made 66no and then took 4-12 off 6 overs, while Brayden Butler made 41 and Jacob Blackwell took 4-18 off 5.5 overs. Well done boys, keep up the good work. T20 BLAST: The last Milo T20 Blast session will be held at Gretna this Friday at 4.30pm. There will be a sausage sizzle and a special visitor is expected from Cricket Tasmania. A group photo will also be taken, if each child could be in their T20 shirt and hat that would be much appreciated. Lindisfarne 3/242 off 30 overs d. Gretna 8/80 off 22.5 overs at Gretna. Batting: Sam Jackson 15 (3x4s), Aiden Featherstone 10no (1x4), Connor Gittus 9no (1x4), Brodie Scanlon 9 (2x4s). Bowling: Ilar Flynn 1-17 (3), Kyle Picken 1-29 (3), Aiden Featherstone 1-36 (4). Wellington 8/130 off 22.2 overs d. New Norfolk 7/97 off 18 overs at Collinsvale Oval. Batting: Jack Morgan-Miller 51 (7x4s, 3x6s), T. Oakley 8no (1x4). Bowling: Jack Morgan Miller 2-8 (3), Tom Eiszele 1-10 (3), Lewis Spaulding 1-10 (1.2), Jakob Quarrell 1-15 (3), Whatt Townsend 1-16 (3), Bobby Nossiter 1-17 (3), Cameron McMaster 1-19 (3). Gretna 4/125 off 22 overs d. St Anne's 7/120 off 30 overs at Gretna. Batting: Zac Wheeler 50no (8x4s), Brayden Butler 21 (2x4s), Cameron Clark 14 (1x4), Dylan Davis 10no (2x4s), Josh Whyte 10 (1x4). Bowling: Cameron Clark 2-11 (6), Tyler Scanlon 1-5 (3), Jacob Blackwell 1-7 (4), Hayden Davis 1-15 (4), Dylan Davis 1-19 (4), Zac Wheeler 1-22 (6). Glenorchy 7/90 off 20.4 overs d. New Norfolk 7/66 off 22.1 overs at Boyer Oval. Batting: Jake Stevenson 25 (5x4s). Bowling: Jack Gordon 2-16 (4), Jordan George 1-5 (4), Baine Tomlin 1-7 (2.4), Jake Stevenson 1-7 (2), Zayde Hill 1-8 (2). Gretna 7/147 off 28.5 overs d. Brighton Red 8/145 off 29.5 overs at Thompson Oval, Pontville. Batting: Zac Wheeler 66no (10x4s, 1x6), Brayden Butler 41 (5x4s, 1x6), Jacob Blackwell 8no (2x4s). Bowling: Zac Wheeler 4-12 (6), Jacob Blackwell 4-18 (5.5). Under 13 - 9am start. Gretna v Kingborough Knights at Glenora District School. Under 14 - 9am start. Gretna v Glenorchy Magpies at Shoobridge Park. New Norfolk v North Hobart Demons at Boyer Oval.